Rebounding after a tough loss in May, Tonya Evinger dominated Adrienna “AJ” Jenkins en route to a second-round TKO stoppage victory at Raging Wolf 8: “Cage Supremacy” last night. 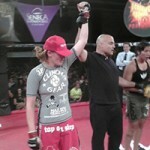 The win earned Evinger another shot at Raging Wolf Women’s Flyweight (135-Pound) Champion Alexis Davis. Evinger battled ring rust in her first bout with Davis at Raging Wolf 7, but that did not appear to play a factor last night as she controlled the fight with Jenkins from start to finish. Following a series of punches from mount in round two, the fight was stopped, giving Evinger the well-deserved victory. Evinger took Jenkins down right away in the opening round and worked from her guard, then stood and passed to side-control. She continued to dictate the fight on the ground and prevented Jenkins from standing. Evinger herself stood up and kicked at Jenkins’s legs, then returned to strikes on the ground to cruise to a dominant 10-9 first round. The second round opened with Evinger falling while throwing a kick, but Jenkins could not capitalise and Evinger soon returned to her feet. She took Jenkins down and moved to side-control again, landing punches along the way. Evinger then moved straight to mount and teed off with punches until the referee stopped the fight. The victory sets Evinger up as the next title challenger for Davis. Result: Tonya Evinger defeats Adrienna Jenkins by TKO (Punches) at 3:16 of round two. She improves to 8-4-0 with the win and becomes the number one contender for the Raging Wolf Women’s Flyweight Championship. In other featured bouts at Raging Wolf 8, Aljamain Sterling defeated Zech Lange by Unanimous Decision after five rounds for the Raging Wolf Amateur Featherweight Championship, while TUF alum Corey “The Real Deal” Hill submitted UFC and WEC veteran Kit Cope with a triangle choke at 2:30 of round one in a non-title bout. The main event saw Nuri Shakir defeat Allen Arzeno by submission due to an armbar at 4:06 of round four to capture the Raging Wolf Welterweight Championship.